John has saved many a potential walking route from being lost from public hands. He has spent many years working with Thelma Anderson on the Walking SA Trails Access Committee manually checking Government Gazettes to find and review potential road reserve closures that would impact on walking trails, then later took over and upgraded processes with IT. Over a long period of time he has provided monthly reports and has actively represented the interests of the walking community with Council authorities and land owners. John was a long time Board Member of Walking SA. Whenever there was work to be done he was there with ears pinned back, a most impressive worker. He convened the Trails Sub-committee – one maze of trails negotiated and surveyed by him was the Sturt Gorge. His contributions were characterised by thoughful professionalism, thoroughness and tenacity. John supported the Adelaide 100 from the time the concept emerged in 2012. He enthusiastically provided his expertise in route negotiations and continues to contribute with his electronic mapping skills. 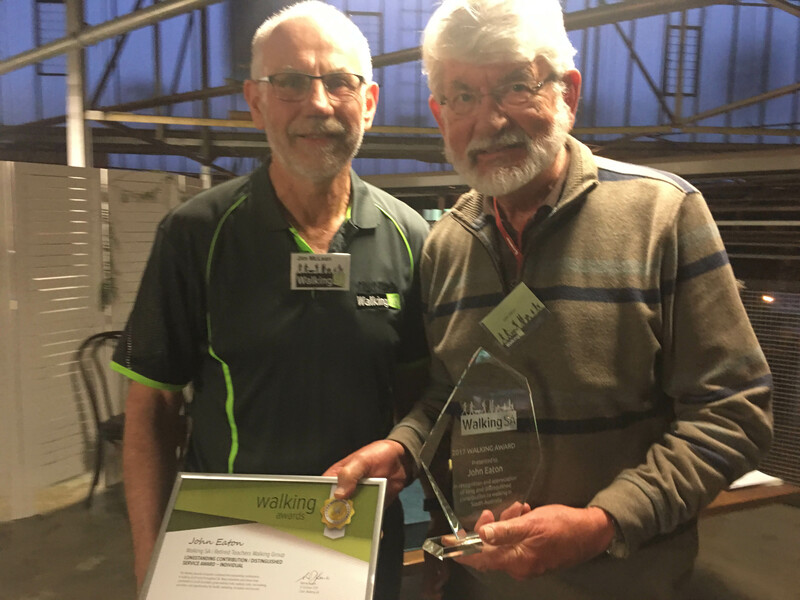 From 2010 John worked tirelessly with the Mt Lofty Ranges Trails group, for and on, the revival of the old trails network in and around the Forestry SA land around Kersbrook. He is noted for the huge amount of time he spent on survey work and data collection. The first 4 trails of the new network were officially opened at the Kersbrook Institute on Sunday the 8th October 2017. In conjunction with the Adelaide Hills Council, after winning finding for a feasibility study, he developed an ambitious plan to complete the Pioneer Womens Trail through to Hahndorf with a pedestrian bridge across the Onkaparinga River at Verdun. Despite, after 15 years, the initial proposal not succeeding, he has not given up and is currently working on a very promising simpler alternative. John and his wife Faye joined the Retired Teachers Walking Group in 2000. He has led walks in all four grades each year from 2001. He was convener of the group for 3 years, 2003 to 2005. He led camps on four occasions. He welcomes and encourages new members. He keenly assists in all group activities.